Modified 05/10. Added in new photos. Before the Fall, the craftworld of Dan-Wen came from the most technologically advanced world in the eldar empire. The name of the world is now lost to time and has become a crone world inside the eye of terror. To them the fall of the eldar was plain to see. 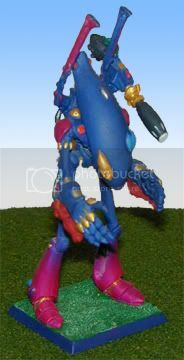 Many eldar on their world either gave up their studies to be a part of the pleasure cults or became "mad" scientists creating disgusting abominations. Seeing the decline of the eldar race to decadence, they fled the empire to start anew in the farthest reaches of the galaxy where they encountered many dangers, both natural and unnatural. A few settled worlds to become exodites but many stayed on the craftworld to more easily defend those worlds and to continue their scientific and philosophic studies. 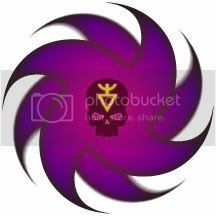 The eldar of Dan-Wen do not believe in the re-building of an eldar empire but they do not want the eldar race to vanish into non-existence either. They have made themselves the protector of eldar maiden worlds and some exodite worlds. The main area of their protection is the far galactic north-east in the area known bye the alien monkeigh as the ultima segmentum. They have fought many different alien creatures to keep them away from the worlds they protect or force them off if needed. They have currently deployed forces to the exodite world of Isha&#39;zuun to fight off a splinter fleet of Tyranids. They keep contact with other craftworlds and consider craftworlds Alaitoc and Iyanden to be allies but they hold suspicion of others. 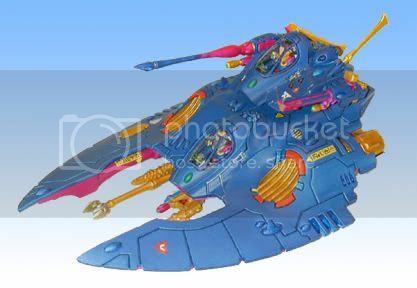 A few eldar corsair fleets have also called craftworld Dan-Wen home at one time or another. Currently they have the corsairs known as the Dark Stars lending their strength to their navy. They will not deal with the dark kin at any time and will ally with the Harlequins rarely. They have strong ties to many exodite worlds and will fight with them often. Against chaos they hold no special hatred and do not seek out the old foes. They believe it is better to conquer the chaos in their own heart than to fight it elsewhere. Chaos can not be destroyed but only tamed in each of them. But of course if threatened by any the of the followers of disorder they will destroy them. Of the xenos like the monkeigh and orks, they see them as bugs constantly infringing upon eldar worlds and in need of culling. Of the Tau they are neutral at least until the young race attempts to add an eldar world to their expanding empire. They however fear the Tyranids and Necrons. Believing them to be the greatest threats to the galaxy. Dan-Wen likes to use it&#39;s superior technology and speed against it&#39;s enemies. They will use mostly bikes, vehicles, warp gates, and titans when they can. This does not mean they will not use troops if they have to. They have many aspect temples to call upon for help as well as a well trained volunteer army and navy. On occasion they will have exodite Dragon Knights joining their forces when trying to defend their home world. Dan-Wen has most of the aspect temples known to eldar craftworlds. Dire Avengers being the predominant aspect and banshees being the least. But it is known for it&#39;s rare vehicle aspects and it&#39;s unique close combat aspect known as The Bloody Hands of Khaine. Rare on the craftworlds is the Aspect known as the Hammers of Vaul. An aspect dedicated to the use of eldar Vehicles. Due to it&#39;s high technology, Dan-Wen has a few temples to this aspect. For plus X points. 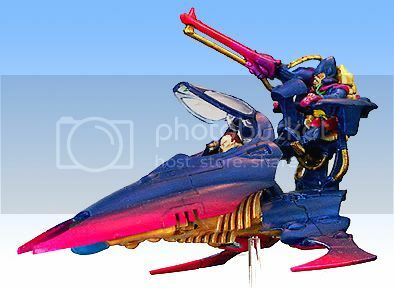 Eldar vehicles may upgrade to this aspect. They gain +1 to BS and WS if applicable. In addition War Walkers gain the "Fleet" special rule. Weapons: Shuriken Pistol, Eldar Power Glove, Plasma Grenades. Transport: The squad may be mounted in a Wave Serpent. The exarch may upgrade to the double power glove. A glove on each arm with integrated shuriken pistols. This gives +2 attacks as well as a re-roll to hit when shooting his pistols. Master Strike. An exarch my give up all his attacks to strike once at triple his strength. The aspects armor is golden with it&#39;s power glove being crimson. They also tend to be bare headed but this is not always the case. Outsiders are eldar that tire of the rigid order of craftworld life. Some may become rangers that explore the galaxy through the web way or they may become corsairs. The Dark Stars corsair fleet has been with the Dan-Wen craftworld for many years. Most of the outsiders that make up the fleet are from Dan-Wen craftworld, though some are from other craftworlds as well, or even young exodites exploring the galaxy before settling down on their world. They are as likely to fight other eldar just as much as others. They will work as mercenaries for just about any race and even chaos if the price is right. There is nothing they will not do. For the last few decades they have been acting as scouts for the Dan-Wen, looking for rogue Tyranid ships and trying to lure them towards imperial settlements rather than eldar maiden or exodite worlds they were going towards. Started as a jest from her fellow Farseers, Wen-Auralith has turned the nickname of Shortseer into great renown. Never adept at "Far" seeing. Wen-Auralith has perfected her "Short" sight. She can see within the first few seconds to a couple days with unerring accuracy. In combat she is a whirlwind of death as she knows what her opponent is going to do before they even know. When other Farseers can only see the outcome of the battle at the end, she has helped to make that outcome happen by accurately predicting enemy troop deployments, abilities, and numbers. Allowing the elder army to outmaneuver the enemy at every step. Powers: Always Fortune first and then choice of other. When on the battlefield Wen-Auralith has the Autarch ability to add +1 to reserve rolls. If an Autarch is present she can advise him to increased his ability to +2 for reserve rolls. A bit brazen and brash, the former Fire Dragon aspect warrior, Warlock Dan-Zaraha can always be found in the thick of the fighting in battle. He uses his ability to project crackling psychic energy to destroy his foes. He is so skilled he can focus his energy into a tight beam that can cut through tanks as if they were paper, and can make a psychic sword of energy to wield in combat. Essentially he is a warlock with Destructor and a Singing Spear. CDK, you and I are going to get on very, very well. The only thing I&#39;d say is I dislike the Chinese/pseudo-Chinese in your symbol - though the tri-force and yin-yang I do like a lot. The pink on that Vyper is impressive! The whole thing looks very early-90&#39;s anime to me. 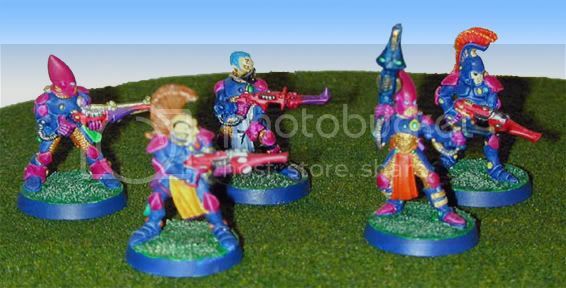 I didn&#39;t like the Eldar paint scheme at first but when I scrolled down and saw the models I was pleasantly suprised. y&#39;know, that paint scheme reminds me of the show Exo-squad. I dont know if you remember that or if you&#39;re in a different country I dont know if you had that show over there. Just thought it was kinda funny. But anyway, cool stuff on your DIY Craftworld. I was lazy and decided to go with a Codex Craftworld. Circus: I&#39;m really into Chinese philosophy, I&#39;m a taiji instructor sometimes, and the Eldar written language is very similar to Asian writings, I can&#39;t remember the exact term, but a symbol meaning a whole word or words. 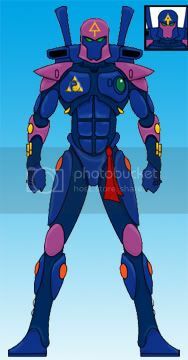 I took the Chinese words for Science and Philosophy and made them more Eldar looking. Also, the triple triangle and the yin yang are seen a lot in the eldar iconography. Just look at their decals. I guess I could straiten out some of the lines more on the words but I want it to still look Chinese too. I&#39;m a graphic artist too BTW so I love making this stuff. Restayvien: The pink should look a bit more magenta. Actual paint is Warlock Purple. Though it did come out bright when using white undercoat. I used air brush for the falcon and the Wlord. I wish I did it on the vyper because I was not happy with the blends at all. Also, these were done about 10+ years ago or more. When did 2nd ed. come out? I&#39;m in the US so what are wellies? lol. Jedibean: I&#39;m in the US so I&#39;m not sure if it had a different name here. I&#39;ll look it up. If you don&#39;t do your own craftworld then do your own sub-host or something within the craftworld to put your own mark on it. What did you all think of my aspects? For the Bloody Hands I will be using warlock rules to play them in games with that are not friends or "official" games. 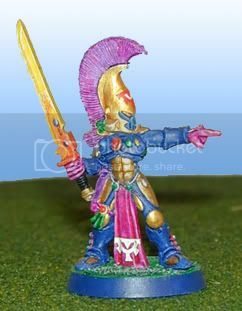 I also have to somehow find old plastic eldar powerfists. The word is "logogram." I studied Chinese, so as such I don&#39;t see the similarity between Chinese writing and Eldar writing - it&#39;s very superficial. The triple triangle and the yin yang are very appropriate though, I have no issues with them whatsoever. I just have a bit of an issue with people using Chinese writing to make something look more "exotic," especially as it&#39;s basically akin to just writing it in English in Times New Roman in most cases. Don&#39;t get me wrong - I like your stuff a lot, if I didn&#39;t I wouldn&#39;t have karma&#39;d you for it - I just think the use of the Chinese is unnecessary. I like the Aspects too. They&#39;re both ideographic systems but beyond that the style is very different. From the few examples we have of Eldar runes in the 3rd and 4th ed codexes, it looks like there are four systems, none of which look particularly Chinese. The 1st is the hieroglyphic system, the highest of the runic systems that seems to be reserved for the runes of craftworlds or gods. These tend to be pictures instead of runes and are shown on pages 15-20 and 77 of the 4th ed book. That said, figures from mythology like faolchu seem to have their own, and their seem to be many hieroglyphic forms of names such as the plate on the back of the saim-hann autarch on 72 of the 4th ed codex or the farseer on 74, equally it is also used in prohopecies and the like as in the tablet at the back of the 3rd ed book. It seems to be mainly an elaborated form of the second system with a few extra characters. The 2nd is the hieromesal system, the second of the runic systems. It seems to mainly be used for proper nouns such as the names of aspects, units and other ranks such as "farseer", "scorpion", "avatar" or "wraithguard". These characters are all based around a central equilateral triangle with modifying it. The triangle is either pointing upwards or downwards, never sideways. Modifying strokes seem to be lines descending from the horizontal stroke of the triangle which may be crossed, have wings or be terminated in some way (such as with a v shape or an arc), wings are also used as are &#39;crosses&#39; as seen on the rune for fire prism or falcon on page 67. The other sides may have &#39;horns&#39; like those on the fire prism rune or fire dragons. Also, lightning bolts are occasionally used (as in the shining spears rune). The 3rd system is the submesal runic system. This doesn&#39;t appear anywhere in the 4th ed codex but is the most commonly used system in the 3rd ed codex so it possible that it has been retconned into the cursive system I&#39;ll describe below. The submesal system is squarer but still features quite a few triangles and arcs (see "weapon iconography" at the back of the 3rd ed book). The largest sample of this is surrounding the fluff below Iyanna Arienal&#39;s entry in the 3rd ed book. It seems mainly to be composed of varying numbers of square zig-zags or squiggles, with some w shapes. Common pseudo-diacritical markers are filled in triangles with a few empty triangles as well. Circles are relatively common in the non-zig-zagy characters but are almost always broken in one or two places. Dots are sometimes used as are other lines. Lastly there is the cursive system which is the most common system seen in the 4th ed book even though you probably haven&#39;t noticed it. It is the pale grey watermark text beneath each unit name in the first section (with the detailed rules). It seems to be primarily based on s shapes with a few circles and triangles. It is likely to be a cursive (handwriting-y form) of the submesal system. That said it uses dashes as diacritics a lot more than the submesal used dots. Cursive symbol, hieromesal symbol, hieroglyohic rune for my craftworld (the flame between worlds), submesal symbol, hieromesal, hieromesal, cursive, submesal and hieromesal. Later I&#39;ll post a list of the modifiers on hieromesal symbols with best guesses as to meaning. Impressive TGS, and thanks. Have a cookie. That was an awesome rundown on the eldar language. Props! I&#39;ve looked over it again and think I made a bit of a mistake. I now reckon there are three systems, two of which have a cursive form. There is the hieroglyphic system, which is as described in my first post. I haven&#39;t seen a cursive form of it but it wouldn&#39;t surprise me if there was one. Then we have the mesal system which is effectively the hieromesal character set I described in the first post. The &#39;high&#39; form of this is the full ceremonial form such as the farseer rune on page 74 of the 4th ed book which is the high form of the cursive farseer rune seen on page 60. It is interesting to note that Eldrad&#39;s rune, even though it should be cursive, uses the full form. Lastly we have what is probably an alphabetic system which spells out words based on sounds rather than representing words. I say this because the sheer quantity of text in it suggests that either it is alphabetic or there are brief essays written behind each of the entry titles. The high form of this is the submesal system as seen in 3rd ed. The cursive form is that seen in 4th. Hmm... Instead of posting all this analysis here, I think I&#39;ll work on making it more consistent and ironing out any errors etc. and start a new topic with all of that.